Burrowing scorpions are usually good at finding their way home to their burrows. But how to they manage this? Gaffin and Brayford published a study late in 2017 studying the importance of the pectines in navigation. It has been well known that the pections has chemo- and mechano (vibration) sensitive sensors that are important in reproduction and prey capture, but can they also play a role in navigation? 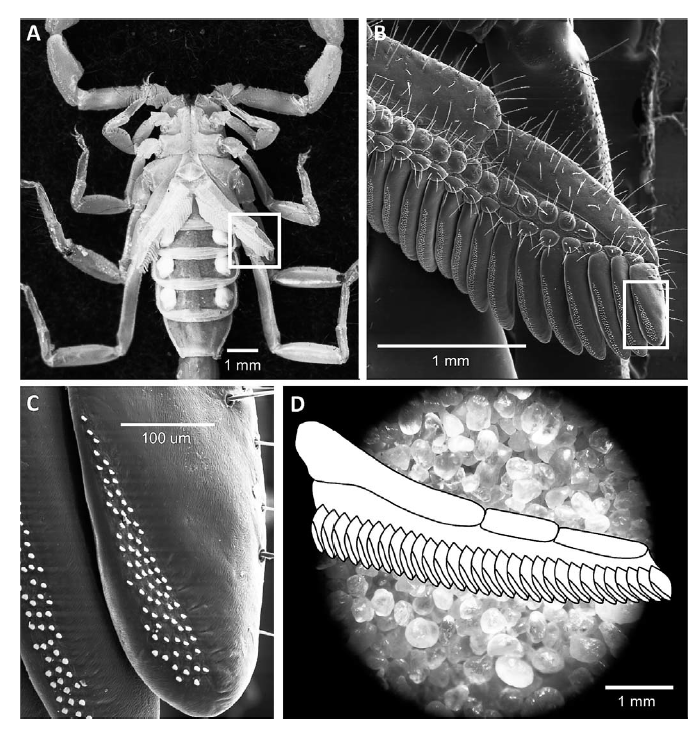 Their study seems to confirm that the massive amount of peg sensillas on the pectins help the scorpion create a sort of chemical texture map of the area the scorpion moves in. This map can be used to quickly find the way home to the burrow after a successful prey capture. The navigation by scene familiarity hypothesis provides broad explanatory power for how bees and ants navigate from the hive to distant food sources and back. The premise is that the visual world is decomposed into pixelated matrices of information that are stored and readdressed as the insects retrace learned routes. Innate behaviors in these insects (including learning walks/flights and path integration) provide the important goal-directed views to allow the initial retracing (i.e., the insect must learn the scene while moving toward the goal because everything looks different while moving away). Scorpion navigation may use a similar premise, with the chemical and textural features of the environment substituting for visual input. Scorpion pectines support thousands of chemo- and mechano-sensitive units called peg sensilla, each containing at least 10 energetically expensive sensory neurons. We have long wondered why pectines have so many pegs and associated neurons. Many sand scorpions emerge onto the surface from their home burrows at night to pursue insect prey and somehow find their way back to their burrows. Based on the measured resolution of peg sensilla, we have calculated that sufficient information exists in sand’s texture to enable scorpions to retrace previously experienced paths with little to no chance of confusion. Preliminary evidence of learning walks and path integration in scorpions is also congruent with the navigation by chemo-textural familiarity hypothesis. Thanks to Matt Simon for telling me about this "old", but interesting paper that I seem to have missed when it was published! thks for your post !